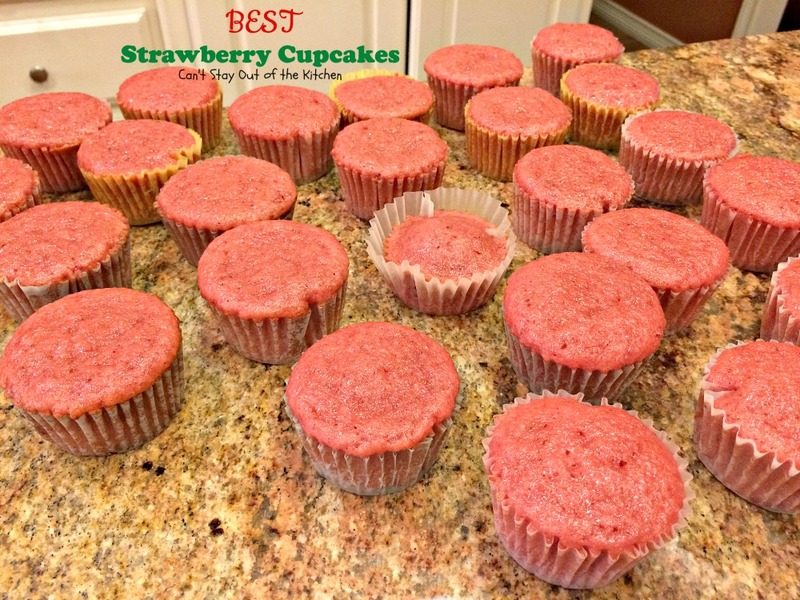 Okay, when I say “BEST” I really mean “BEST!” BEST Strawberry Cupcakes are so scrumptious you will be drooling after one bite. No kidding. This was one of those recipes I collected several years ago that I just never got around to making. Though I still want to make it as a cake, I decided to try it first in cupcake form. Oh, my, goodness. Heavenly does not even begin to come close to describing this decadent, delicious, delectable dessert. When I first pinned this recipe back in 2013, it was one of those pins that got pinned and repinned at a really high rate. 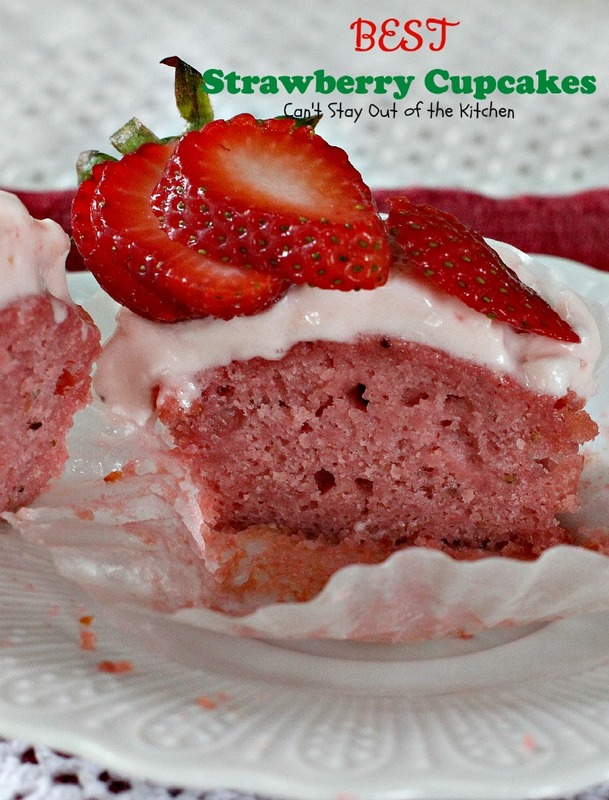 And really, who can resist a recipe entitled The BEST Strawberry Cake? Well, I have three or four Strawberry Cake recipes in my recipe collections, some with a cream cheese icing, others with a buttercream icing, but this recipe takes the cake! Truly. 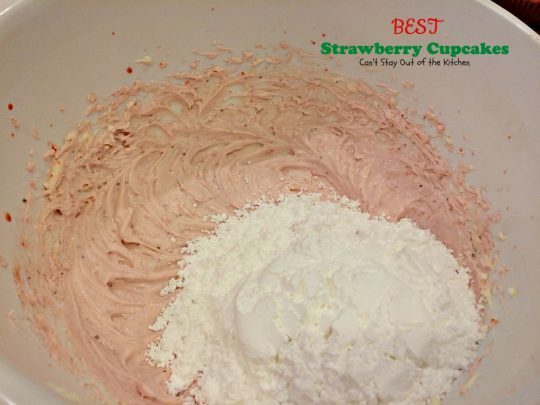 It is THE BEST Strawberry Cupcakes or cake recipe you will ever eat. Why, you say? 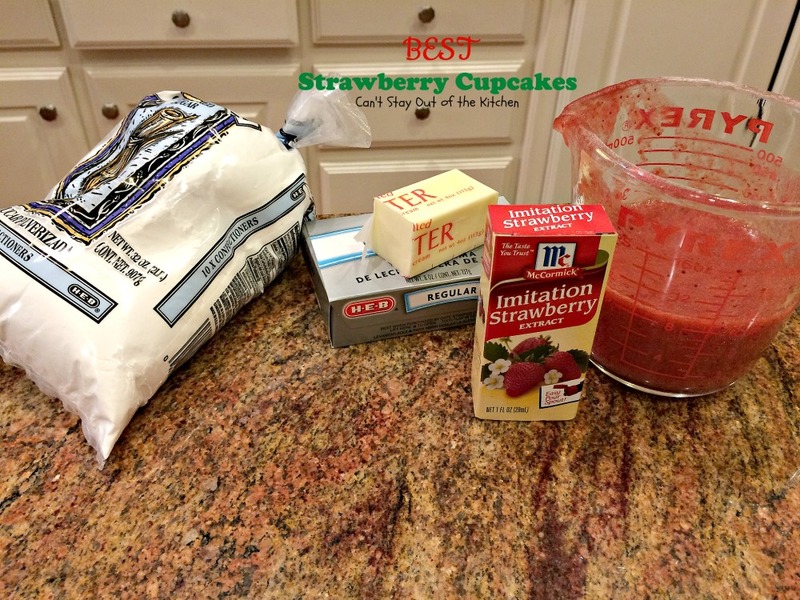 It uses strawberry gelatin and (frozen then thawed) pureed strawberries and syrup in the cake, and the icing uses more pureed strawberries and syrup and strawberry extract! I’d never heard of using strawberry flavoring in any recipe before this one. I had to go out and purchase it, because it’s one of the few extracts I don’t keep on hand. 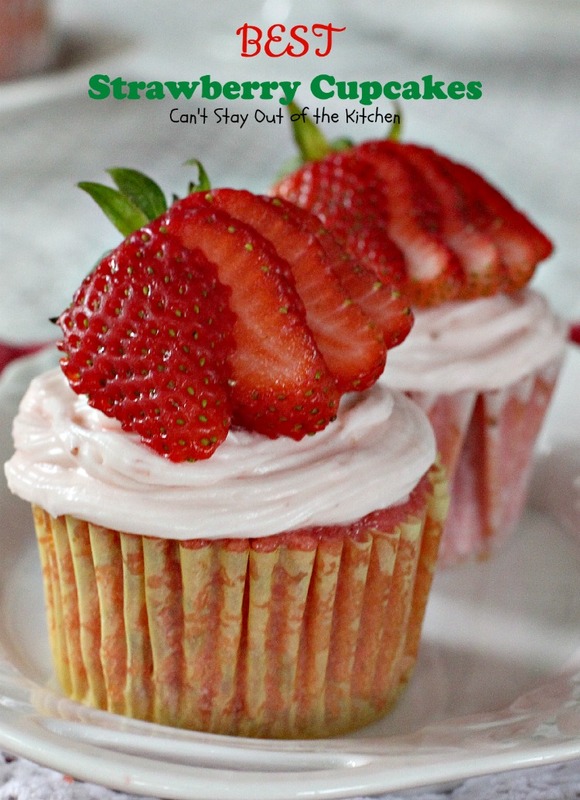 These cupcakes were moist, filled with strawberry flavor and had an amazing frosting. Then of course, I topped each one with fresh strawberries for presentation and to pack an additional punch of flavor. Divine. I had a friend call me and ask me if I wanted to provide some desserts for a youth fundraiser dinner she was helping to hostess. The organizer actually wanted cakes, so when I suggested cupcakes and brownies, she was willing to acquiesce but she really wanted cakes. I didn’t have time to do all of it, so I made these cupcakes along with some Lemon Blondies and my Marbled Chocolate Cheesecake Brownies. Debra bought a couple of bakery cakes to appease the hostess. But she told me that she had 10-15 people come up to her afterwards and tell her they loved my desserts. These cupcakes in particular, were a spectacular hit. I know why. They are just mouthwateringly good. Had I not given them away, I would have eaten a LOT more than the one I sampled. I’m not really much of a cupcake baker. I’m used to making cakes instead. It’s only been since I’ve started this blog that I’ve really gotten into making muffins more often. I suppose I don’t like taking the time to decorate individual cupcakes that’s holding me back. Really, though, they’re not all that difficult. 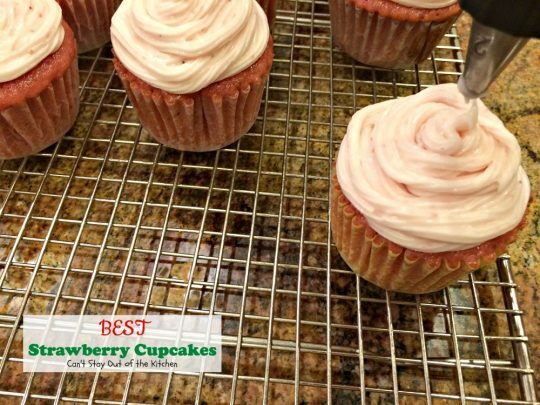 If you’re looking for a scrumptious strawberry-flavored dessert to serve your family, friends, company, or to take to an office party then, by all means, take some of my BEST Strawberry Cupcakes. They are so amazing all your friends will be raving and drooling over them like there’s no tomorrow! 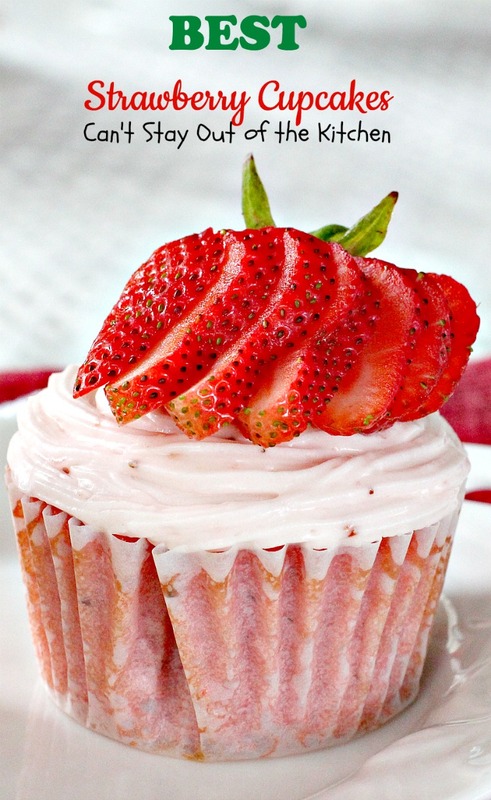 BEST Strawberry Cupcakes are a sensational treat to make for holidays like Valentine’s Day, Mother’s Day, anniversaries, or for Christmas holiday baking. These festive cupcakes were a huge hit with the folks we served them to. BEST Strawberry Cupcakes have a rich strawberry-flavored cream cheese frosting to die for! 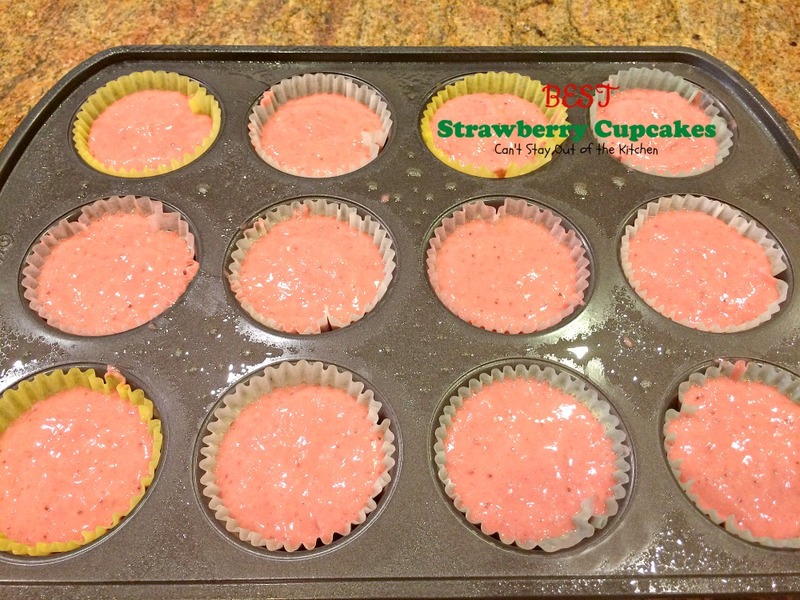 Mix dry cake mix and dry strawberry gelatin until no lumps remain. Add eggs, oil and water. 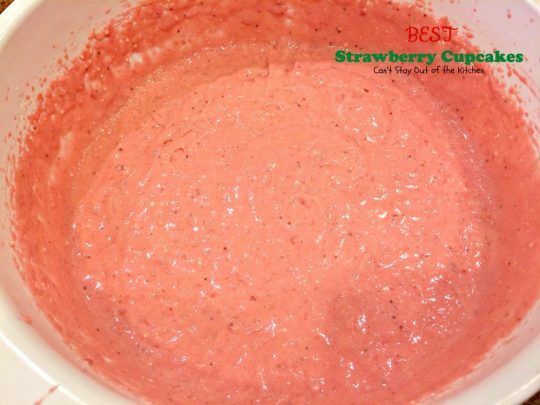 Puree thawed strawberries in a blender. Add to other ingredients. Mix ingredients with an electric mixer until well blended and smooth. Place cupcake holders in muffin tins. Spray each with cooking spray. Divide cake batter among 24 or 25 cake tins. I used these ingredients to make the frosting. 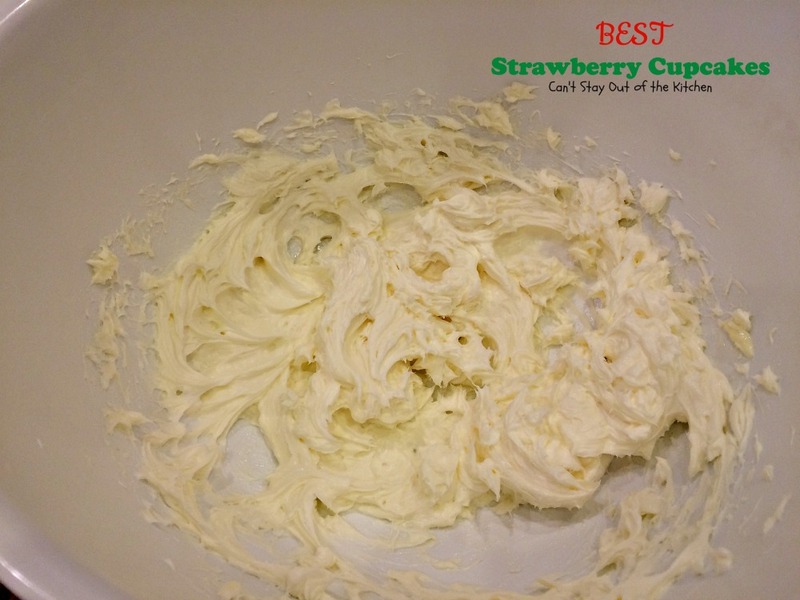 Cream softened unsalted butter and softened cream cheese with a blender until smooth. Add powdered sugar a cup at a time, mixing with an electric mixer after each addition. Mix with an electric mixer until smooth and creamy and all the sugar is incorporated. 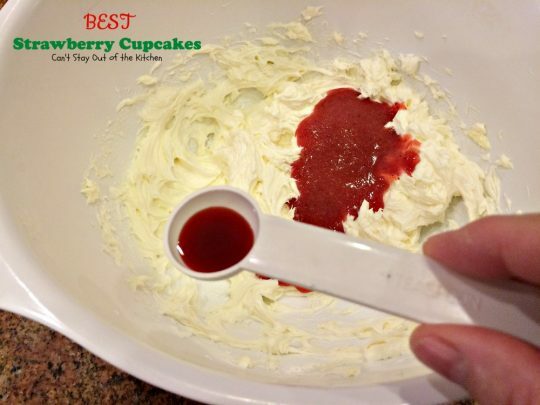 Spoon cream cheese frosting into a pastry bag. Pipe filling over top of cupcakes in any pattern you desire. Garnish cupcakes with sliced strawberries, as desired. Refrigerate until ready to serve. 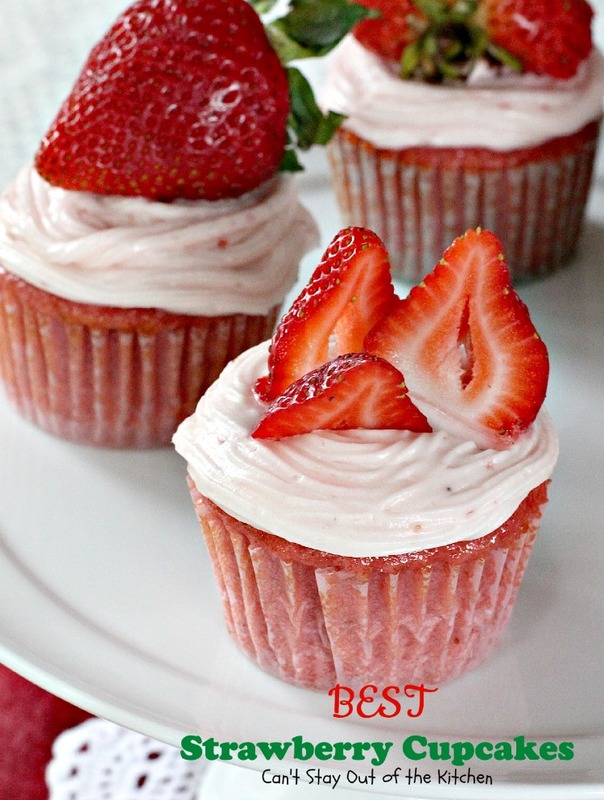 The most delectable, decadent, delicious dessert cupcakes you will ever eat! These incorporate strawberry gelatin and pureed frozen (thawed) strawberries and syrup in the cupcakes and pureed strawberries and strawberry extract in the cream cheese frosting. This is a great dessert for holidays like Valentine's Day, Mother's Day, holiday Christmas parties, or special occasion birthdays and anniversaries. 15 oz. 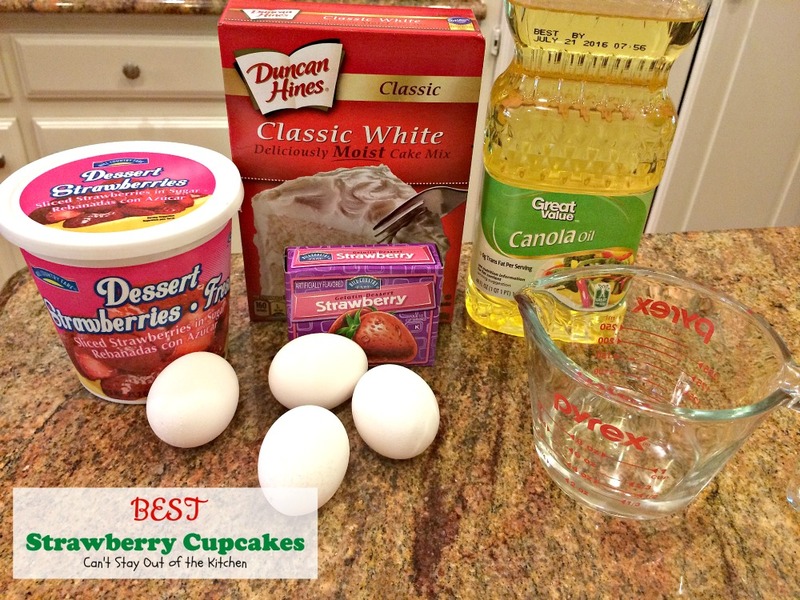 box Duncan Hines white cake mix not YELLOW! 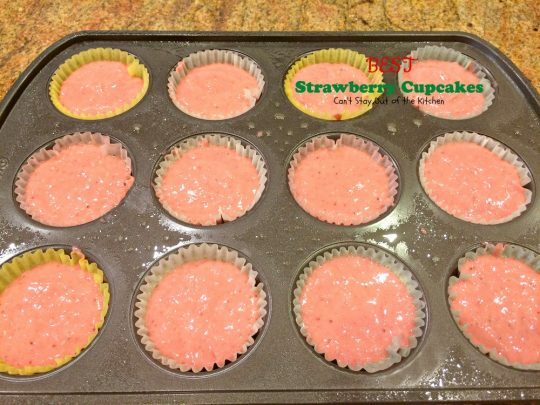 Place muffin or cupcake liners in muffin tins and spray the inside of the paper liners. 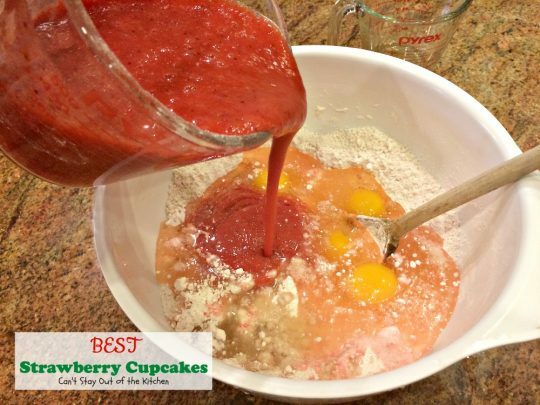 In a large mixing bowl, combine cake mix and gelatin. (Make sure you get all the lumps out of the mix). 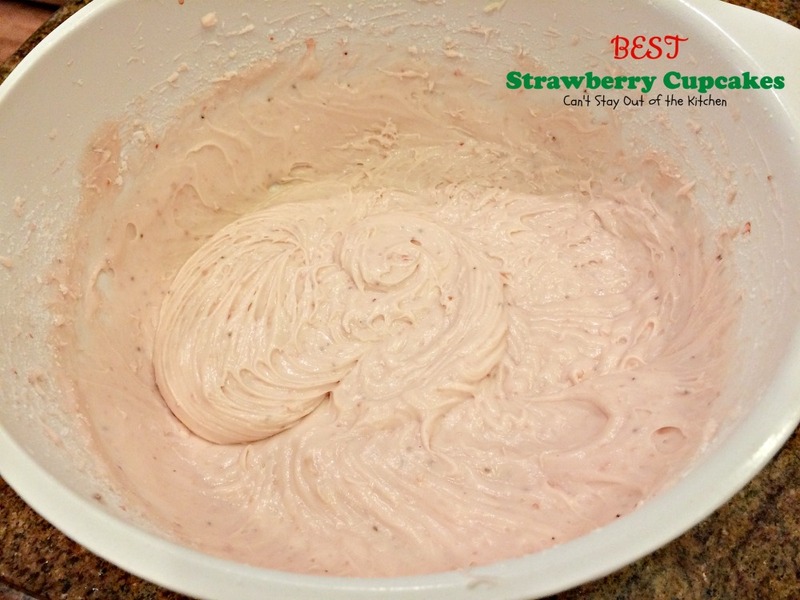 Add pureed strawberries, eggs, oil and water and mix with an electric mixer until smooth. Pour into prepared liners and bake at 350° for about 15-20 minutes or until a toothpick inserted in center comes out clean. 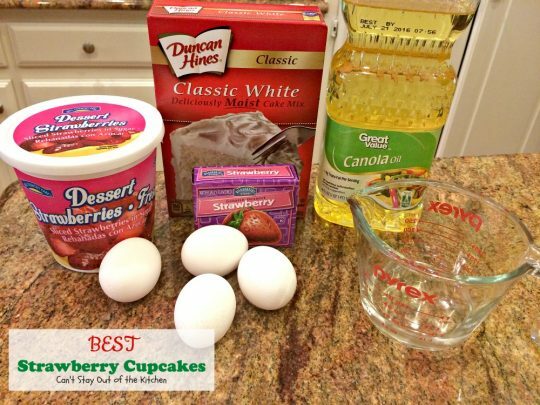 Allow cupcakes to cool about 5 minutes before removing to a wire rack. Cool completely before frosting with cream cheese frosting. Beat in ¼ cup of the pureed strawberries and the strawberry extract. 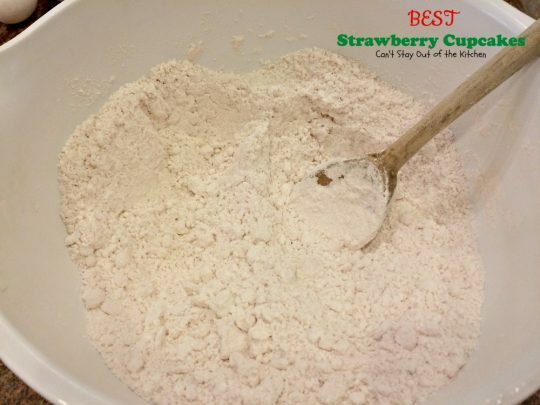 Gradually add in the powdered sugar one cup at a time beating well after each addition. Beat until you reach the desired consistency. Spoon frosting into a pastry bag and pipe frosting over top of cupcakes. Garnish with fresh strawberry slices, as desired. NOTE: You will not need all of the pureed strawberries for the icing. Use remaining in other recipes or smoothies if desired. NOTE: I know this seems like a LOT of powdered sugar, but you will use ALL of it! NOTE: I used all but about 1 ½ cups of the frosting. If making a cake you will need all of it. Recipe adapted from Cooking with Crevolyn. 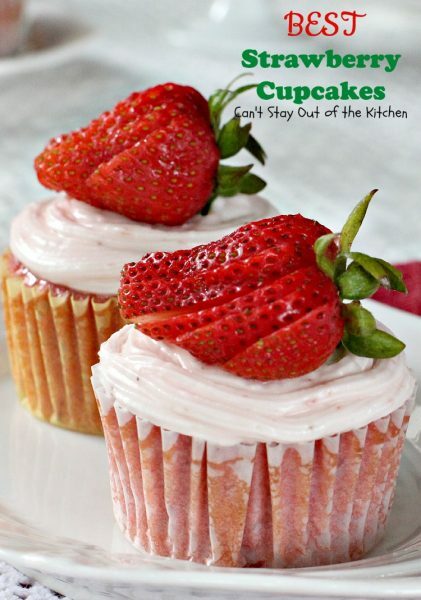 The most delectable, decadent, delicious dessert cupcakes you will ever eat! 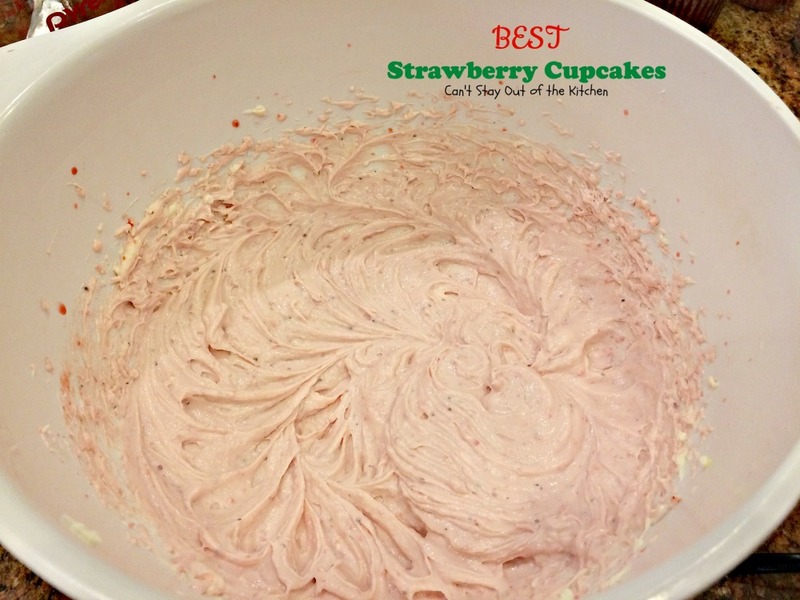 These incorporate strawberry gelatin and pureed frozen (thawed) strawberries and syrup in the cupcakes and pureed strawberries and strawberry extract in the cream cheese frosting. This is a great dessert for holidays like Valentine’s Day, Mother’s Day, holiday Christmas parties, or special occasion birthdays and anniversaries. You will not need all of the pureed strawberries for the icing. Use remaining in other recipes or smoothies if desired. [br][br]I know this seems like a LOT of powdered sugar, but you will use ALL of it! [br][br]I used all but about 1 ½ cups of the frosting. If making a cake you will need all of it. Every bite of BEST Strawberry Cupcakes is amazing. 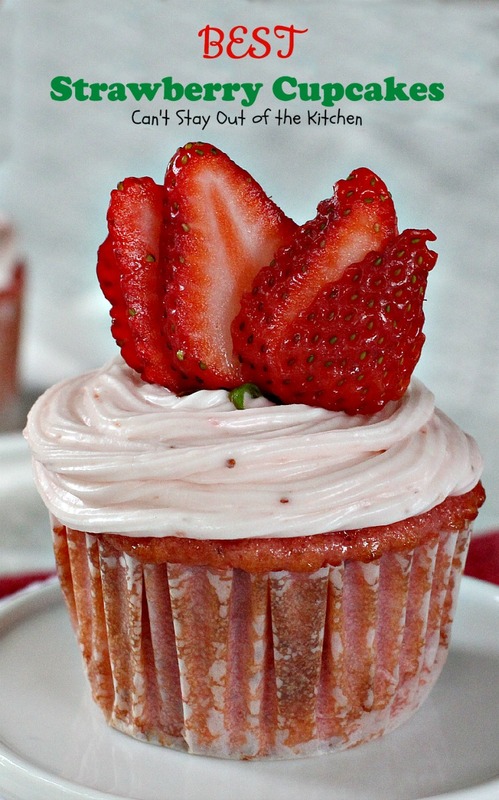 I have made the strawberry cupcakes and they are the best! Took them to my husband’s work and they were gone in no time, thanks for the recipe. I’m trying the cake now and it’s in the oven. Hi, Cindy. I’m so glad you enjoy the recipe. I love both the cupcakes and the cake. It’s so rich and delightful. Enjoy. Thanks! It is one of our favorite cakes, but very rich. Thanks, Kim. 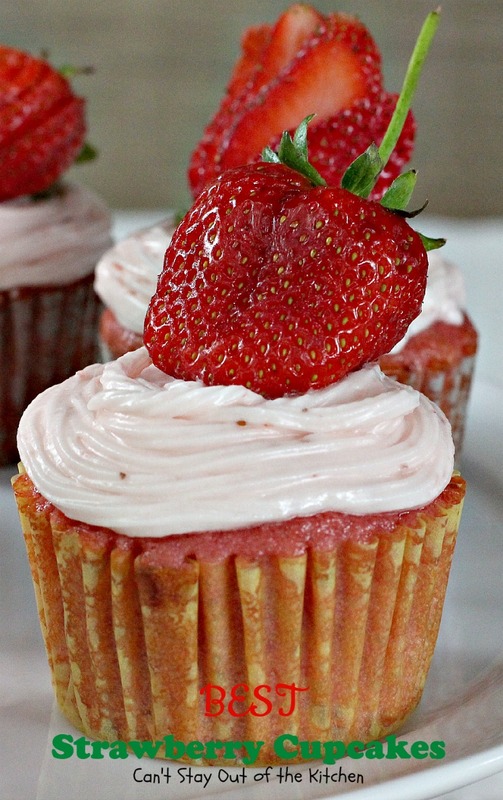 Seriously, these are the BEST strawberry cupcakes (or make as cake) that I’ve ever eaten.